When the wonderful happens, when a holiday abroad is a splendid success or an unlikely romance ends happily, we commonly exclaim it was "just like a fairy tale," overlooking that most events in fairly tales are remarkable for their unpleasantness, and that in some of the tales there is no happy ending. The Classic Fairy Tales is a revealing book about the most popular fairy tales that most of us were introduced to as children, through bed time stories or Disney movies. 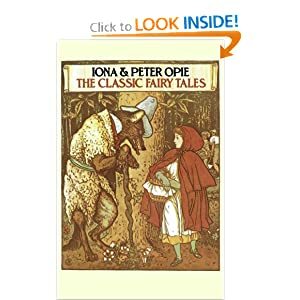 What makes this book, written by Iona and Peter Opie, interesting, is that the authors reprint the tale as it first appeared in English. Additionally, the authors provide a historical context for each fairy tale, including parallel tales from cultures around the world. The Classic Fairy Tales includes 24 classic fairy tales from Jack and the Bean Stalk to Cinderella to Beauty and the Beast. Most of these will be familiar to the majority of readers. The book was published in 1974 and is reprinted from a 1980 edition. Often beginning as spoken tales before being transcribed, these fairy tales reflect the norms and values of the time. Thus you may find original stories where the brides were only 14 or 15 years old when offered for married. Many of the tales include "wicked" stepmothers because at the time, women frequently died young and widowers with several young children immediately needed a wife to assist with parenting. Wells also play a prominent role in many of the fairy tales because this was the "water cooler" of the day. People gathered around the wells to share stories, interact, and gossip. The magic in the tales lies in people and creatures being shown to be what they really are. Usually the tale is about one person, or one family, having to cope with a supernatural occurrence or supernatural protagonist during a period of stress. The hero is almost invariably a young person, usually the youngest member of a family, and if not deformed or already an orphan, is probably in the process of being disowned or abandoned. Unlike the contemporary, rewritten versions of fairy tales, most of the original tales contained very little magic. Enchantments (spells) were often temporary. Additionally, as the authors point out in the introduction, some of the tales do not end happily. In the most-loved fairy tales, it will be noticed, noble personages may be brought low by fairy enhancement or by human beastliness, but the lowly are seldom made noble. This is not a children's book. It is very educational in terms of the forgotten history and evolution of the classic fairy tales. In a large sense, this book serves as a reminder that how we recall stories today was not always the case. All of the quotations on this page are from the introduction.